If you're interested in entering your band in the Macy's Thanksgiving Day Parade, click here to access the online Macy's band application. The deadline to apply for the 2020 parade is February 1, 2019. 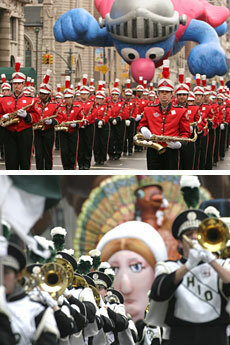 Macy's Thanksgiving Day Parade kicks off the holidays with unparalleled pomp and pageantry. The scale of the Macy's Thanksgiving Day Parade is immense: more than 3.5 million people view the parade live along the parade route, and more than 50 million viewers tune in to the television broadcast. Spectators watch in awe as 10,000 participants  including the nation's best marching bands, performance groups, giant helium balloons, breathtaking floats and the one-and-only Santa Claus  pass before their eyes. Each year, top marching bands of all varieties from across the country are invited to represent their states in the annual parade. In addition, the Macy's Great American Marching Band returns to the parade route this November with more than 250 participants representing all 50 states. Band directors are invited to submit an application along with a video of a field marching performance to the Macy's Band Selection Committee. Applicants are thoroughly reviewed and decisions are made by early May, approximately 18 months in advance of the invited bands' appearance. Additional 2020 bands will be added here as selections are announced.